We are passionate about physical activity at Edinburgh Leisure; we constantly see the positive impact physical activity has on individuals’ and communities’ physical, mental and social health and well-being. And that’s why as a charity we are committed to inspiring everyone in Edinburgh to be more active and healthy. · And yes, it can be fun! Physical activity is the best gift you can give to yourself, your family and your friends. The video below was produced by Dr. Mike Evans. It's an informative insight into the single best thing you can do for your health - be active! Check out these handy infographic guides for adults and children and young people on what you should be doing to keep a healthy body and mind. I’d already put my two eldest sons through swimming lessons. however in the last few years my budget has got really tight and with three young lads to look after, there’s barely enough to cover the essentials. Sandy started ‘Jump In’ through his nursery school and it turns out he was a natural and loves being in the water. 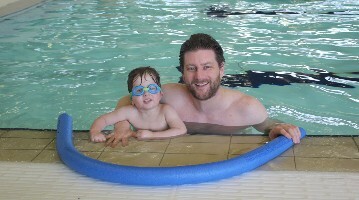 Because of the discount, I was able to continue with his lessons and he can now swim safely. Now, if I get the chance and have the money, I’ll take the boys swimming on a Friday afternoon. They all love it. It keeps us active and is a great thing to do as a family. ‘Jump In’ made this possible and has meant that Sandy didn’t miss out. I would find any excuse to get a take-away and was partial to a sausage roll. At first I didn’t notice the weight gain, but then I started slowing down, feeling stiff and couldn’t be bothered. As a full time carer for my wife, I was struggling to cope with the lifting and carrying. When I started feeling faint, my family made me go to the GP, who told me I was pre-diabetic. I needed to change my diet and start doing exercise, so was referred to Edinburgh Leisure’s ‘Get Moving with Counterweight’ programme. I was a little nervous before starting; I didn’t know what to expect, who would be there, what I would be made to do. The welcome from the coaches and enthusiasm from other participants quickly put me at ease and made me feel comfortable. I’ve not had a sausage roll since I joined. Finding out how much exercise I would have to do to burn it off has stuck with me. I don’t eat processed foods and I’m sticking to my portion sizes. I’m not depriving myself, just being sensible. 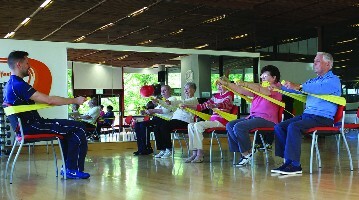 I actually really enjoyed the physical activity sessions the most and have been doing things I hadn’t done for years. It was great having someone there to push me.Now I feel so much better. My trousers have gone from too tight to too loose. I don’t feel as sluggish and I look forward to my walks, going to the ‘keep moving session’ and the gym at Portobello. One morning when I was out walking, I felt that I wanted to run. So I did - it felt brilliant. Before the programme I couldn’t have even have run for a bus. Edinburgh Leisure’s Steady Steps is a 16 week falls prevention programme that supports adults who have had or are at risk of having a fall. 75 year old Norm had a serious stroke which left him paralysed from the waist down and unable to walk. Following 5 months of recovery and physiotherapy Norm was able to walk with the aid of a walking frame. However, he could not leave the house without assistance and was completely reliant on care from his wife. Both feared he might fall and they found themselves becoming more and more house bound. 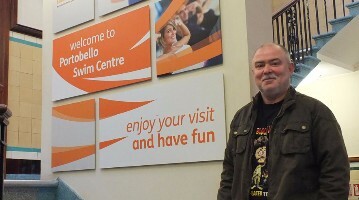 Norm was referred to Edinburgh Leisure’s Steady Steps classes where he found the variation of exercises helped him gradually regain his mobility and independence. Check out the clips below and get inspired by participants talking about the positive impact physical activity has had on their lives. We have a number of activities and programmes which are ideal for anyone looking for a gentle start to help improve their health. You will find us conveniently placed at over 30 locations across the city with a variety of opening hours to fit around your schedule. We have activities for all ages and abilities, from Abseiling to Zumba and lots in between, to inspire you and to help keep you active and healthy. Edinburgh Leisure's Community Access Programme (CAP) is designed to support community groups working with people facing disadvantages. 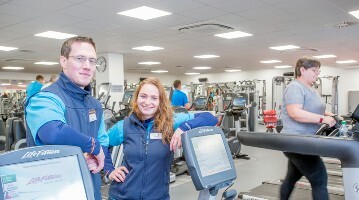 It encourages people to start doing physical activity through making more and better use of Edinburgh Leisure facilities with subsidised access.The project works with registered charities based in Edinburgh who want to increase the amount of physical activity that their service users participate in.